The gaming headset industry remains a highly competitive space. HyperX is a premium gaming brand under parent company Kingston (best known for computer memory products), and they have been manufacturing gaming headsets since 2014. Their Cloud Revolver line of headsets boast large drivers and an expanded, “Studio Grade” sound stage, which promises to give gamers the upper-hand in competition. If you are able to hear your opponents before they can hear you, the argument goes, then you have a better shot at winning. So how does the recently-updated headset stack up in reality? 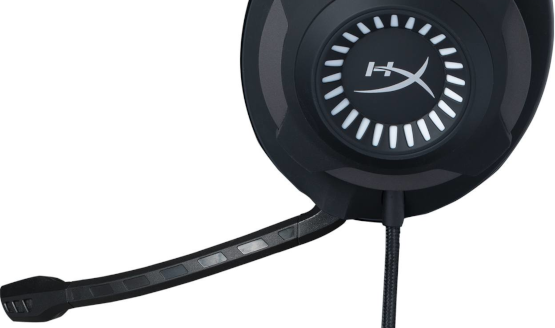 Find out in our HyperX Cloud Revolver review. 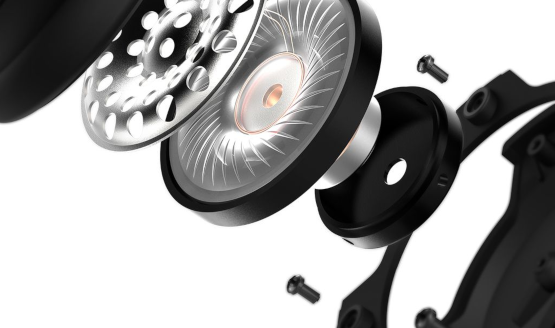 There is no mistaking the Cloud Revolver for just another set of headphones. Distinctive white markings on the cups surround the HX logo, and the entire frame is made of a sturdy steel. This material does add to the weight of the headset, which is 376 grams (13.26 ounces, or around 0.83 pounds). That may sound on the heavier side, but due to the suspension system in place, the headset’s weight is evenly distributed on your head and won’t pose much of an issue during longer gaming sessions. It should be noted that HyperX has seemingly updated the Cloud Revolver this year – it used to have red color accents on a black frame, and now sports white accents on a gunmetal black frame. So, what’s changed then? It seems the material surrounding the cups has been upgraded, and the cups themselves have been closed entirely. The first version of these headphones had small cutouts in the cups, to show off the distinctive red foam HyperX headsets are known to sport. But this represented a weak point, and the reviews of the 2016 model on Amazon point to some serious deterioration issues after roughly the two year mark. Naturally, we haven’t had these headphones in our possession for that long. But the changes do point to a longer expected lifetime, which means a better return on your investment. Both the cups and headband feature extremely soft foam, which causes the headset to lightly rest on your head, while the frame provides just enough tension to prevent the cups from sliding all over the place. Rubbing against the cord while wearing the headphones does cause the sound to reverberate into the left earcup, but it isn’t very noticeable, especially while actively gaming or listening to music. The Cloud Revolver features 50mm drivers, described by HyperX as directional. You can just call them powerful. The size of the driver naturally lends itself to big sound presence, but their extra-wide sound stage tuning makes everything pop. The low-end response rate is 12 Hz, which is well below the sound that most people can hear. However, low frequencies can actually be physically felt at a high enough volume. The result is a bass response that is incredibly clean. You’d be hard-pressed to find a song that the Cloud Revolver couldn’t faithfully reproduce, and in-game explosions, such as the satisfying thermal imploder from Star Wars Battlefront II, also impress. The company claims that their headset’s expanded response allows players to hear approaching footsteps sooner, thus earning an advantage in games. Apex Legends in particular depends upon getting the jump on your enemies, something we are eager to put to the test after extended time with this and other headsets. This expanded sound stage includes the high-end as well, with an upper limit to response of 28 KHz, again well above the average person’s ability to hear sound. This means most audio tracks and video games will not have their acoustics cut off due to the equipment it is played on. Audio quality is about as subjective as things can get, as everyone’s ears are different. But this expanded sound stage guarantees that every genre of music and game can be enjoyed with an emphasis on accuracy. There is no processing going on with these headphones (though the S model includes a Dolby-powered USB sound card), resulting in audio that sounds great no matter the genre. A good set of cans that is great for music may not necessarily be good for gaming. But HyperX is a brand from Kingston designed with gamers in mind. So naturally, the Cloud Revolvers have been tuned with gaming at the forefront. All this means is that the overall sound signature is neutral. There is no extra emphasis on bass, mid-range or highs. This is important in games such as first-person shooters, since having an enemy’s approaching footsteps sound identical to some other sound effect due to some “enhanced” tuning of the drivers may cost you your in-game life. The Cloud Revolver includes a detachable boom microphone. It’s very flexible, and as it’s omnidirectional it also tends to only pick up the wearer’s voice, while drowning out background noise. The mic is TeamSpeak and Discord certified, so the voice quality is serviceable for voice chat. Retractable microphones are ideal, but at this price level they are not very common, and removing it is a simple process to get the mic out of the way when you intend on playing solo games or just jamming out to your favorite music album. The built-in audio cord is approximately 1 meter/yard in length, which is long enough to leave a good amount of slack when using the DualShock 4. The included 2 meter/6.5 foot extension cord also includes a control box, which allows you to control audio volume and toggle muting of the mic. However, this control box splits the cord into two, one for audio and the other for microphone input. This means the extension cord cannot be used with the DualShock 4, as the controller only boasts a single headset port. Not a deal breaker, but a combined length of 3 meters/nearly 10 feet would’ve come in handy for streaming on the PS4 while charging the controller, for instance, or muting the mic without physically detaching it or messing with the PS4’s settings. A few design decisions may end up impacting true long-term reliability on the Cloud Revolver. First, the audio cord coming out of the left earcup is non-replaceable. An appreciable percentage of headsets within this pricing range do have detachable cords, which can act as a safety measure if the cord is tripped over, and of course a non-replaceable cord will wear down over time as the headset is used. However, this and the included extension cord are of the threaded variety, which increases durability. So, with any luck, the cord will last for a decade or longer before failing with average care. Another potential point of hardware failure may lie in the earcups themselves. A lot of headphones encase the drivers inside a plastic structure, like a perforated cage of sorts. This helps to protect the sensitive hardware (specifically, the delicate diaphragm). However, this introduces space between the driver and the listener’s ear canal, however slight. It can also perhaps cause the soundwaves’ path to the listener’s ear to alter slightly, as some reflect off the enclosure. So it seems HyperX chose to forgo protection in order to deliver a purer sound. All this means in practice is that you must take care when you carry the headphones, as grabbing the cups by both sides is not recommended. The Cloud Revolver is a fantastic headset for the modest MSRP of $119.99. The expanded sound stage is appreciated for first-person shooters, while general media usage benefits from this as well. A pillowy-soft headband feels weightless even after multiple hours of intense gaming, while the generous size of the cups will wrap around most people’s ears entirely. A non-detachable audio cord will likely pose a reliability issue after repeated use, but since the cord is threaded, with average care any potential issues won’t surface for several years. An included extension cord with inline volume control and mic mute toggle ensures plenty of space to control the experience from a distance, as well. Overall, the expanded sound stage may prove to be a boon to players’ game, while the extremely comfortable fit will help you play for hours on end. HyperX Cloud Revolver review unit was provided to PlayStation LifeStyle by HyperX/Kingston. For more information, please see our Review Policy.